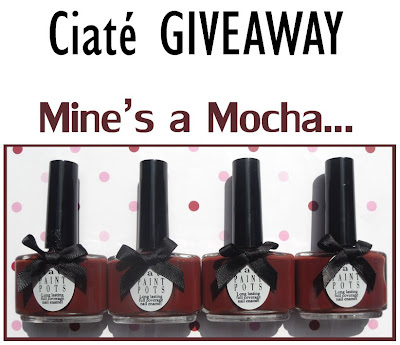 I have 4 of "Mine's a Mocha" paint pots by Ciaté to giveaway. Leave me a comment below, stating that you would like to enter. winners will be chosen from random.org. To learn more about "Mine's a Mocha" check my previous post here. GOOD LUCK! Winners will be announced on Sunday 16th August. Such a unique colour! I would like to be entered please :) Thank-you! Enter me please! I'm quite curious about these polishes. Please enter me! This color is fierce!!!! Pretty please enter me! You always have such pretty colored nail polishes!! Enter me! That would be very lovely to wear. Nice color. I think the Ciate nail polishes are so cute! Thanks! Ooooh. I'd like to enter. please enter me! it's such a lovely color! please please enter me! please! I would love to win this product, please enter me! I would really love to try one of these products, it seems so nice! please enter me! enter me please! please enter me! i'm so happy about your giveaway! this color is gorgeous. Please enter me in the contest, thanks! lovely nail varnish!! thanks alot for the give-away! enter me please again :D :D !! please please enter me! i really want this! I've been looking all over for these! please enter me. Thankyou!! enter me please :) and check out my blog too!! I've been wanting one of these. muhsin emin, please enter me!!!!!!!!!!!!!! I feel terrible that I've been reading your blog for ages (and love it, by the way) but the first time I've actually said hello is on a contest entry. I promise to comment more regularly in the future! Enter me, please and thank you!